Oil futures stabilized on Wednesday after experiencing some of the biggest falls in three months. Brent crude futures stabilized around the 56 dollar mark despite physical supplies of crude rising on the week. According to the Energy Information Administration’s (EIA) weekly data, crude supplies rose on the week by the order of 0.38M barrels. The forecast was for a fall of 0.7M barrels. However the real driver behind the recent volatility in commodities markets has been fears over events in China. In particular, economists are predicting that fallout from the turmoil in equity markets could have a major impact on growth. The Chinese stock market has suffered some of its biggest losses in decades. This came after an equity bubble pushed share prices up over one hundred percent during the past year. Worryingly, high levels of margin lending were seen as a contributor to the bubble. Currencies with exposure to commodities came under strong pressure. 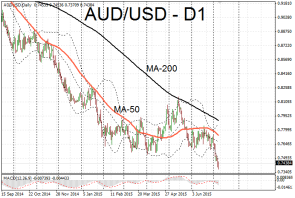 The Australian dollar fell to a six year low against the greenback. 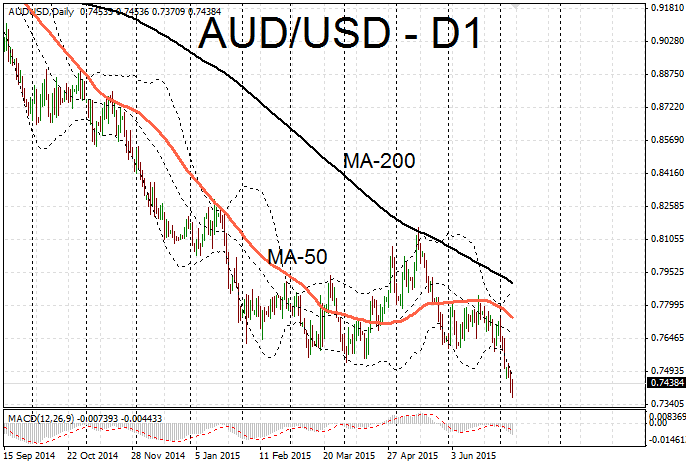 AUD/USD briefly touched 0.7371 before climbing back up on low momentum. AUD/JPY experienced heavy losses moving down to the 89 range for the first time in more than one year. USD/CAD was also bearish as the greenback managed to push the pair up to 1.2732. The New Zealand dollar bucked the trend. NZD/USD rose to 0.6727. After a punishing bear rally NZD/USD finally managed to rise up from the floor and lift one percent. Saudi Arabia: A real desire to rebalance the oil market?